Defenders of soil, air, woods, waters, and wildlife. Founded in 1922, the Izaak Walton League is one of the nation’s oldest and most respected conservation organizations. For complete information on the Izaak Walton League of America and membership, please visit the IWLA national organization web site. GPIW Fact Sheet pdf version. Every year on a Saturday near Earth Day, Glen Park Izaak Walton sponsors a tree give away at our facility, free and open to the public. Past year’s events are always a great success with 200 saplings finding wonderful new homes. Our 2018 date was on April 28th! GPIW offers trap shooting every Wednesday evening and every Saturday morning. The club is open to the public during these times and you are encouraged to come meet our members and take part in the fun. We think you will find that GPIW is the best place in the Northwest Indiana area for trap shooting. Come shoot a round and see what you think! The Glen Park Izaak Walton also offers a private indoor archery and pistol shooting ranges for member use. Most handgun calibers are permitted at our range. The range is located in the lower level of the main building adjacent to the member lounge. Arrows and bolts up to 375 fps are permitted in the archery range. The archery range is located in the upper level of the main building. Pistol and Archery Range hours are from 7AM to 10PM and the range is open to members 7 days a week. Trapshooting is available to members & non-members. The cost of a round of trap, 25 targets, is $4.00 for members and $5.00 for non-members. A round of doubles consists of 50 targets and the cost is $8.00 for members and $10.00 for non-members. Youth shooters (under18) pay $2.00 per round (25 targets). GPIW does NOT accept credit cards. *Active Duty Law Enforcement Officers and Fire Department Officers shoot at member prices during all open trap practice events at GPIW. Please present your department identification at the trap counter for the member discount. NO HAND THROWING ALLOWED. SHOOTING IS ONLY ALLOWED ON THE TRAP FIELDS DURING STAFFED OPERATING HOURS AS POSTED BY THE CLUB. 3 Traps with CVR voice releases. All Trap fields are fully lighted for night shooting. Trap House is 1,000 square feet with AC, heat, and fireplace. Target shells, soft drinks, and coffee are available. PLEASE NOTE* We DO NOT RENT Shotguns. There is 1 trap dedicated to doubles. (subject to shooter demand), and will be available after 4-6 squads of singles or handicap are shot. Eye protection and ear protection is required, and is available. A light lunch is available on Saturdays. Saturday hours vary by season and trap field may close early if there are no shooters. Saturday winter hours are (November-April) 11AM to 3PM – Summer hours are (May-October) 10AM to 2PM (open til 3PM if there is shooter demand). Entrance gate opens 1 hour prior to shooting time. ATA Registered Shoot information at Glen Park. Check out our Trap Shooter Media page. Offering a safe and secure environment, the indoor range at Glen Park Izaak Walton offers the perfect setting for recreational and practice target shooting. With a relaxed and private atmosphere, and the flexibility of range use, you won’t find a better location to enjoy shooting your handgun. The use of the indoor range is strictly limited to members and their guests. This is a private range. Please visit the membership page to inquire about becoming a member of the Glen Park Chapter. There is no outdoor pistol/rifle range at Glen Park Izaak Walton. Shooting outdoors is strictly prohibited with the exception of Trap Range operations and will result in immediate, permanent expulsion from the chapter and the police will be notified. The Glen Park Izaak Walton indoor range is 50 feet with a louvered and membrane covered ballistic back stop. You may shoot from your desired shooting position from 50 to 25 feet. There is a movable, 3 station shooting booth with lights; and chairs are available as well as a work bench at the back of the range. The range has 2 exhaust fans and ceiling lights at multiple distances from the back stop. The range fee is $5 per member and $10 per guest and there is no time limit, but we do ask that you limit shooting to 45 minute cycles if there are others waiting to shoot and no available spots. The range is CLOSED on the second Monday of the month from 7-10pm for our Membership and Directors meeting. The range is occasionally closed for special events or Scouting events. We do our best to post any closure information and send out dates and times via the mailing list in advance. Glen Park offers a private, 15 yard indoor archery range. The range operates 7am to 10pm 7 days a week. Shooters fee is $5, Guests $10. IWLA Archery Instructor Course April 27th and 28th 2019 at Glen Park. These two-day training sessions will provide participants with both Level 1 and Level 2 Archery Instructor certification (as recognized by USA Archery), so you don’t need to already be a certified instructor to attend! Registration is limited, so reserve your spot today! Questions? Email archery@iwla.org. *Hours subject to shooter demand. 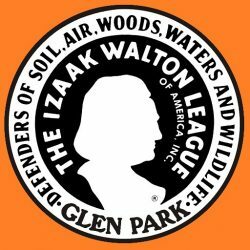 Izaak Walton League of America, Glen Park Chapter Inc.
Defenders of soil, air, woods, waters, and wildlife. Founded in 1922, the Izaak Walton League is one of the nation’s oldest and most respected conservation organizations. The Glen Park Chapter was founded in 1939 and incorporated as a 501c4 non-profit fraternal club.